I, like many many people, do not live in the USA and have scant knowledge of the U.S. army and its ways, so this post has no impact on me, or, I presume, the many millions of people that peruse the internet yet are not American. This USAcentric viewpoint rankles, already we have to put up with old fashioned measurements (feets and inches, wtf ? and temperatures in the 70s that would kill people ???) and such posts as 'The 50 Best Book Stores' which is all about only the 50 best book stores in the USA ! I may sound like a bleeding heart and I may be very able to spell words properly, unlike most Americans, but surely at some point you there in the driver's seat of this very American internet site must realise that the internet, or as some call it, the WORLD WIDE web, does, in fact, reach the entire globe, ... the world in other words, or if you like, let's phrase it so ... it also reaches countries OUTSIDE the USA. I can almost hear your muttered replies, but these days of global communication (Yes, Mildred, you can use the telephone to talk to people overseas now) do you not want your advertising revenue stream to include THE WORLD ??? Reach nearly 8 BILLION people rather than just the 374 million that measure things based on the size of some British king's foot. I could go on but my coffee is getting cold and want to go for a drive in my Chevy and buy some Budweiser ! Lol, My coffee IS cold, but I drive a European car (because I like going around corners) and to prove I am not anti-American, my beer of choice IS a Budweiser. Ok, now stop being so cloistered and have a nice day. Mr. Rocket, let me explain this to you in three sentences that even you should be able to comprehend... and I shall try to leave American weights and measures out of it. The vehicle is displaying a registration plate indicating the holder is a former soldier who had received a medal known as the "Purple Heart". This medal is awarded to any soldier who has sustained an injury as the result of enemy fire or action while in combat or a combat zone. 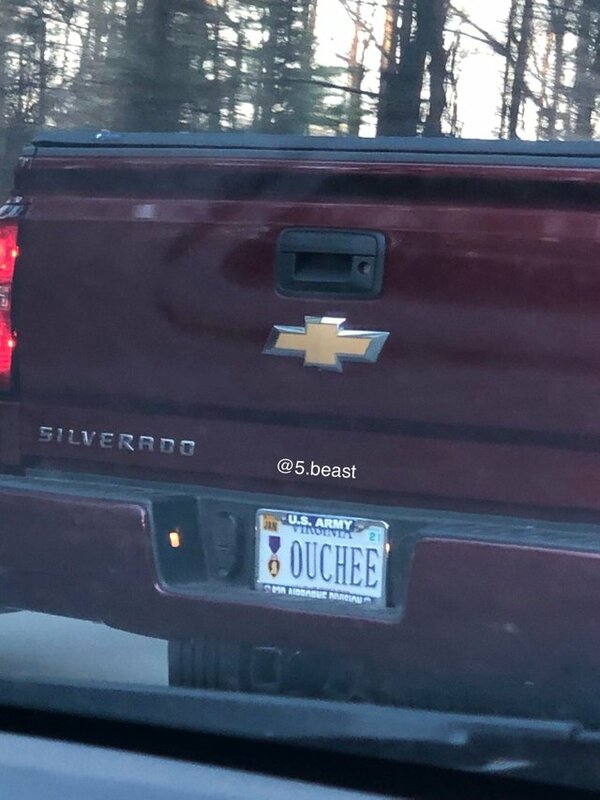 The owner of the vehicle, after paying a small surcharge to do so, has opted to customize the registration plate so that it reads "OUCHEE" instead of the numbers that one might normally find there; a 'message' which, when paired with the 'Purple Heart' medal on the plate, most people would find humorous.